Wow, I just realized it has been almost two months since we posted a note. All I can say is, "It's About Time! We have been busy beyond belief. We were very ambitious for market with lots of new patterns. 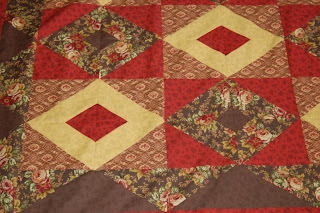 The patterns are all written and up on the website, http://www.abbeylanequilts.com/. Here are a couple of our holiday favorites that you can make now. This is WOO HOO WITCHY. 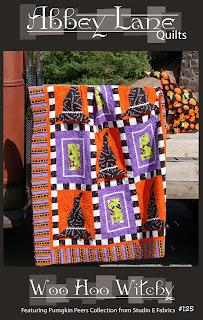 Grab your favorite halloween fabrics and whip it up. The pattern includes a bonus HAT PILLOW pattern. This is STEP INTO CHRISTMAS. 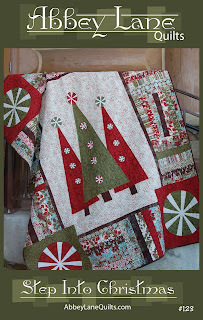 Use a jelly roll or scraps you have in your stash and combine it with some yardage. The big trees have three dimensional peppermint candies for a finishing touch. Summer is in full swing and so are we. Two new designs. Here come the sneak peaks. RJR FABRICS brought us a beautiful new line that will be out this fall. It has rich jewel colors and a little twist on traditional design. The line is called ENCHANTED ROSE. The pattern is called REMEMBER WHEN. RJR FABRICS brought us a second line called DOTS AND STRIPES. We did a new bag for this line. 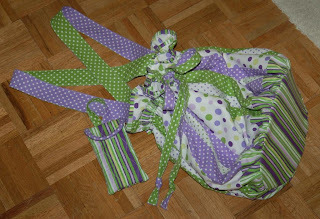 It will be a great basic line of fabrics, polka dots in different colors and different sizes and a great stripe in each color wave. 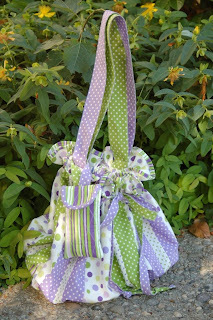 The pattern is called THE ELLIE BAG and it is a great tote. 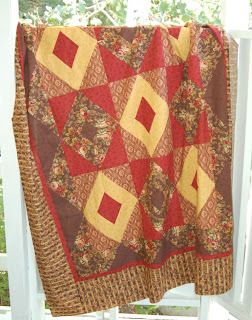 The sample is done in the RJR Fabrics and you can't help but smile when you see it. Two long straps and a draw string add to the fun. Ladies who have seen it, love it. 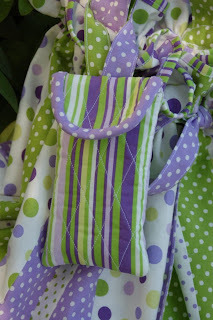 It makes a great beach bag, overnight bag, or a big fun purse. Another bonus also, a little cell phone or ipod carrier. For those of you like me, it makes a great reading glasses case also. I am going to make it this week in some funky, modern Valerie Wells fabric. It will be perfect for that college student or the 25 to whatever age crowd who want to make a statement. Both of these patterns will be available soon. That is it for today. Ya'll have a great day.